January 25, 2018, 6:00 p.m.
Before the meeting was called to order residents were informed management in recent days had distributed in their space cylinders the following items: Park Update, Resident Information Update Form, Notice of Change of Mobile Home Residency Law, Homeowner Directory Update, Notice of Utility Assistance to Low Income Person, and Notice of Rights and Responsibilities (Mobile Residency Law found in Section 798). Some residents had not received these. Our GSMOL area manager Anne Anderson is candidate for GSMOL Vice President for Zone B-1. All GSMOL members, please sign and return your ballots (in the The Californian) before March. Consider a donation to the General Fund to help GSMOL, a volunteer organization, double its membership. One of the reasons GSMOL is important to us is that it monitors all legislation and is our advocate in Sacramento. Eight bills supported by GSMOL became law and the three bills sponsored by WMA – “Western Manufacturing Housing Communities Association” (the park owner’s organization) GSMOL opposed and were not passed. 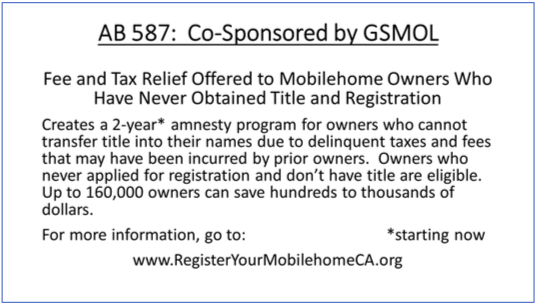 AB 1269, supported by GSMOL and our chapter, passed the legislature but was vetoed by the governor, who felt the expense would not be supported by the income. However, he acknowledged the problem and directed more attention to mobile homeowner’s issues and complaints through an existing mobile home assistance program. GSMOL hasn’t given up and is considering alternatives. $119 rent increase per month for years until the county decision was to cut the increase to $39 per month. 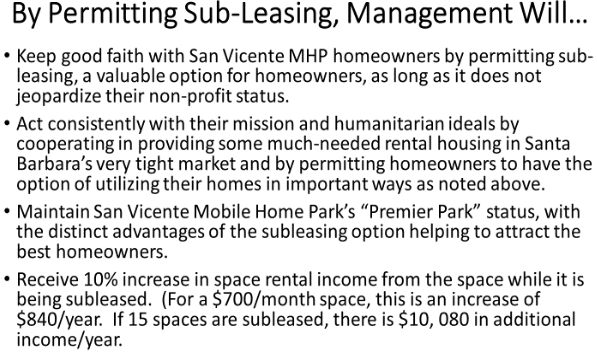 The homeowners report that their park owner is paying them back only in monthly increments in spite of now owing thousands of dollars to each homeowner. We and homeowners in other county parks are concerned about this and consulting GSMOL. 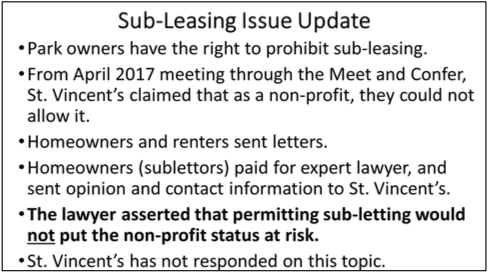 Sub-Leasing Issue Update: St. Vincent’s has reported that the reason they would not allow subletting was because they could not allow it due to their non-profit status. 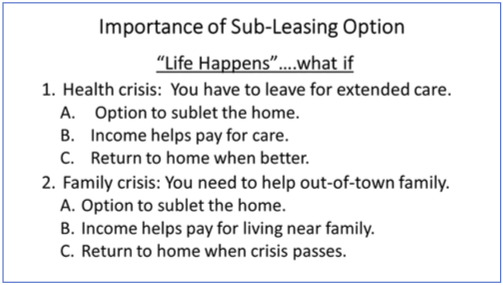 **Existing homeowners are still under Parker/Rice rules. 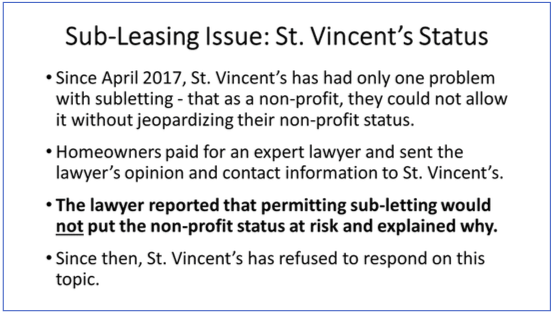 However, we learned that homeowners moving in now are having to sign the 7/17 documents that St. Vincent’s issued last year. 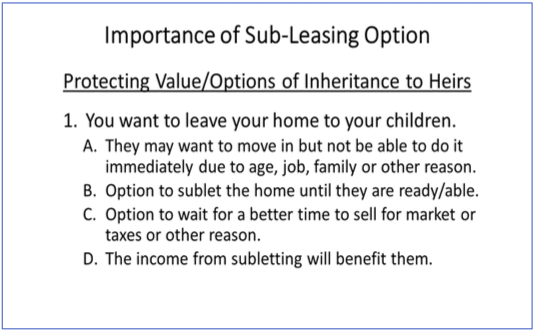 The new homeowners will be under the 7/17 rules until the new documents (not yet issued) take effect. 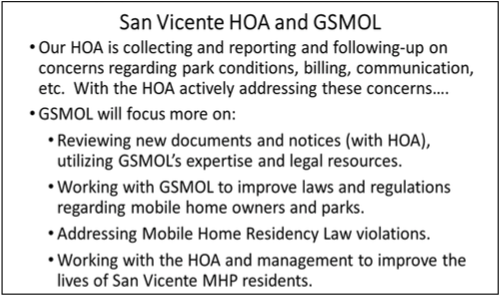 San Vicente HOA and GSMOL: Sharing responsibilities and actively working together to benefit homeowners! Resident expressed it feels like we now have a voice with HOA membership increasing and our GSMOL Chapter reactivated. Residents expressed praise and gratitude to Ellen for her hard work and countless hours shared. Ellen expressed thanks for the support and noted that many people continue to contribute their talents and time. She noted how HOA, led by HOA President Bob Mann, and GSMOL are a great combination, with our chapter’s access to GSMOL’s experience and legal expertise, and our HOA having the money to fund appropriate legal costs. We have actually used very little HOA funds thanks to the very reasonable legal fees and our careful management of what we send to the lawyer for review. She stressed the need to increase and support both GSMOL and HOA. 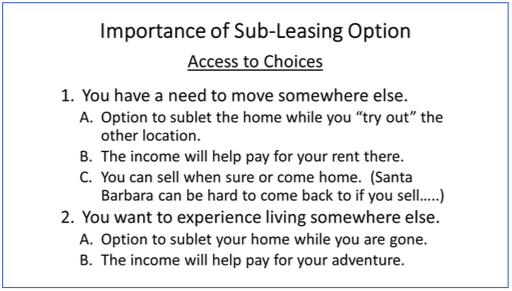 Has anyone looked at the park’s Conditional Use Permit? According to it, St.Vincent’s is responsible for roads and providing guest and residential. Ellen will contact the concerned homeowner about this. A couple had not signed up for GSMOL and called themselves friends of GSMOL because they are sub-lessors. This couple graciously offered that they would be willing to help any resident with the cost of membership if there was a financial need and to contact Ellen about this if interested. Anne Anderson said they could have an Associate Membership. 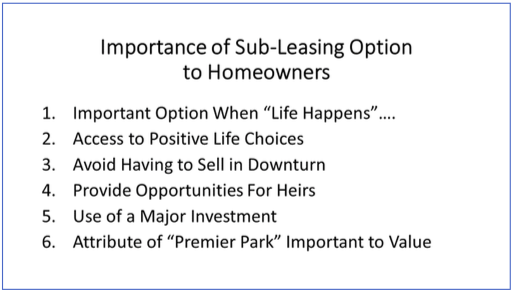 After the meeting they were informed that both homeowners and sub-lessors can become GSMOL members with voting privileges. Why does Rancho Santa Barbara have such great exercise equipment (and we don’t)? It was explained that a local gym was getting rid of their old equipment and this became available to them. Anne Anderson informed us that their pool is being replaced and learned that St. Vincent’s doesn’t allow residents from their park to use ours because of liability issues. There is a concern that the tile in the women’s dressing room and shower at our pool are extremely slippery and the bench is missing. The pool and spa temperature seem to be cool and the spa chlorine appears not to be regulated properly. In the men’s dressing room at the pool, the light switch seems too close to the shower. Is this a GFI issue that needs to be addressed or is it already GFI-protected? A resident has requested a work order to trim the trees on Cathedral Oaks which are overhanging in her yard and others and still had not been addressed. The maintenance team currently has only 4 men and there used to be 6. 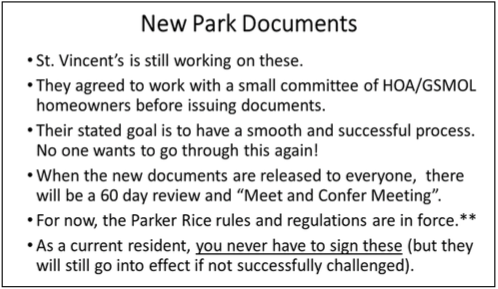 Also, there is a lot more paperwork, and this is reducing time for park maintenance even more. There is a concern that the Christmas gratuity from the residents to the employees was a burden for the office to be responsible for. 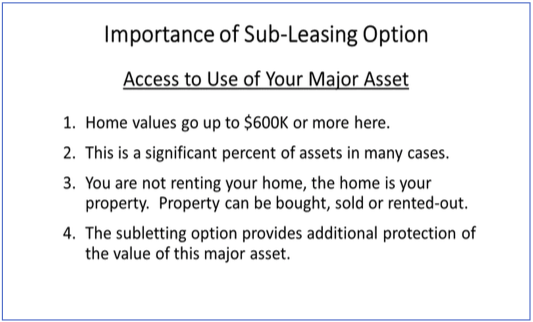 Perhaps this could be something HOA could take care of in the future. Here are the minutes from the Nov. 9th meeting. I will be sending an email to management regarding all items in the Residents suggestions section in the minutes. Thanks for supporting your HOA. It is with heavy hearts that we have lost our Vice-President and former Treasurer Paul Ortega. He will be greatly missed by all. 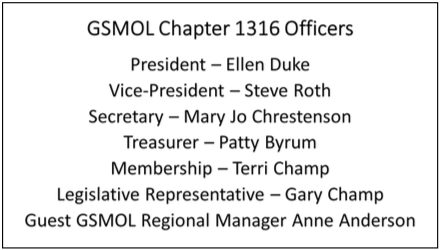 The minutes from the October 12th meeting: motion to approve was made by Tony, Ellen 2nd, and approved by all. Social Committee Report: Mollie Mann December 9 will be our Christmas Dinner. Turkey, mashed potatoes, gravy, veggies, rolls, honey butter and dessert. $10.00 Residents $12.00 Guests plus 2 canned goods/nonperishable to be collected and donated. Cut off is Dec.3. This event is quickly filled up so get your check in soon. 1. 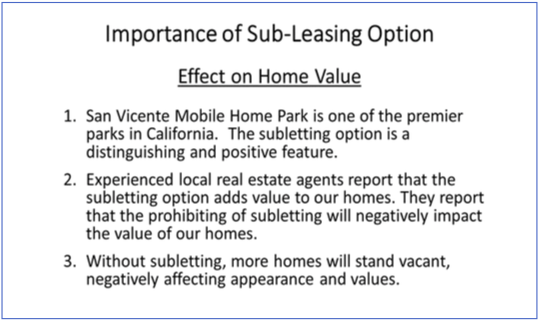 In regards to whether or not San Vicente Mobile Home Park will allow subleasing, we are not ready to discuss this topic at this time since we are still discussing and reviewing it internally with our advisors and attorneys. 2. We are also continuing to update the Rental Agreement and Rules & Regulations. We are anticipating that the draft will be available for the sub-committee’s review early next year. As you know, we do not want to rush this process and are diligently reviewing these documents to ensure they are in compliance with the law. 3. 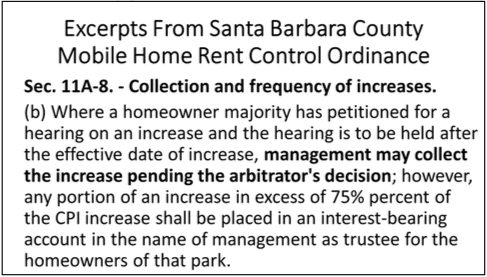 The updated Rental Agreement and Rules and Regulations will be distributed as they were last time in accordance with the Mobilehome Residency Law and a Meet and Confer will be scheduled after the sub-committee reviews the documents. 4. Assuming the meet and confer is scheduled in February/March 2018, means the new documents will be in effect approximately in August/September 2018 of next year. 5. Also, please remind the Residents that they can email or contact the onsite manager directly for any concerns or comments. She will communicate items as appropriate to Mary Manzo or myself. 6. We have interviews scheduled for the office clerk this week. Hoping to fill the position ASAP. Note from Ellen Duke, GSMOL Chapter President, HOA Board Member: Due to last-minute scheduling problems, Rosa was not able to meet with me. We will reschedule before the next meeting. Meanwhile, you can send any questions or concerns about this update or issues not addressed by management to me at ebduke@yahoo.com. It is great to see the improved maintenance on the clubhouse and repair of the pool deck. At the meeting, concerns were expressed about over-chlorination of the jacuzzi due to the need for a new part, and the effect of the reduction in maintenance staff and increased time needed for them to complete new paperwork. There were complaints about how the grounds are being maintained and the cut back in refuse service. 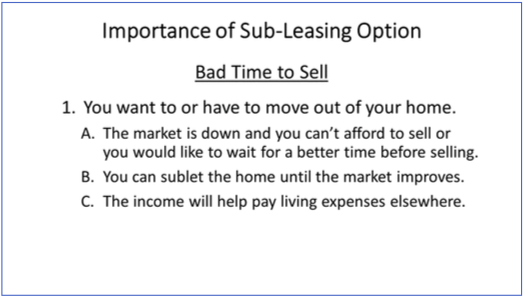 Homeowners were advised to submit their specific concerns to management, and they can copy Ellen and/or advise her if concerned about the response. Business: With the absence of the Disaster Preparedness Group, should the HOA try to continue this program? We have merged the funds from the DPG with the HOA. Steve Roth was in attendance and was thanked for his years of service to the DPG. Anyone that is interested please contact an HOA board member. Resident’s Suggestions: Questions on what is taking so long to fix the pool deck. We passed on that management is also doing some work in the shower area, which might add some time to the finished product. Residents voiced concerns that maintenance issues are being overlooked. Trees needing to be trimmed, bushes hiding stop signs, etc… General consensus is the maintenance crew is understaffed. The Jacuzzi needs some repair. The chlorine level is so high that it hurts your eyes when you are in the water. Garbage pickup question. Only 1 or 2 bags of clippings. 2 different residents were informed only 1 bag a week of yard clippings would be picked up?? Needs to be reviewed by St. Vincent’s. Security cameras were brought up again. Will pass on to the management. Board Elections: 6 positions need to be filled. Max will not be running and with the death of Paul we will need 2 new people to fill their positions. Please contact Board if interested in joining. Bob, Cheryl, Don and Ellen are again running for the board. Last day to sign up is November 10th. Old Business: Gym equipment from Clubhouse is stored at St. Vincent’s. If you want your old equipment you can pick it up. Hopefully new equipment will be coming. Speeding still a problem please ask all to slow down. Continuing complaints.